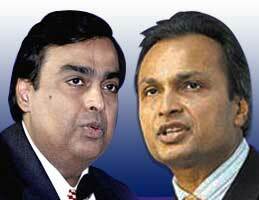 Is reunion possible between Ambani brothers? The reunion of Ambani brothers is on the top of the wish-list of Reliance investors. Their handshake at a meeting of leading industrialists with the Leader of the Opposition, L K Advani, in late 2008, provided fuel to the rumors that the heat of rivalry between Ambani brothers is soon going to cool. Ganesha predicts on whether the Reliance brothers will reunite. The prediction is based on Prashna Kundali (the time the question arose in Ganesha's mind), as his birth time is not available, and on birth chart of Mukesh Ambani. The ascendant of the PK has an exalted Chandra, the Lord of the third house of younger brother. Jupiter the Lord of the eleventh house of the PK signifying elder brother is though debilitated and in conjunction with Rahu and Budha, is in trine to the ascendant degrees, and Moon is also in applying trine to Jupiter. This gives an excellent indication. In Mukesh's chart, Jupiter is the Lord of the third house of younger brother and Venus is the Lord of the ascendant (Mukesh). Moon is placed in the third house of Mukesh. There is a grand trine between Chandra, Sukra and Guru in Mukesh's chart. Jupiter of the PK and Venus of Mukesh are sextile to each other as per house position and square to each other as per sign position, both the Jupiter are sextile to each other per sign position and inconjunct to each other as per sign position. The above mix and match of the horoscopes indicates possibilities, due to the soft aspects, and action towards the same due to the hard aspects. Notice transiting Saturn is passing through Mukesh's Eleventh house of gains over natal Guru, the Lord of his third house, of younger brother. Saturn again is a Yog Karak planet for Mukesh as well as the Prashna Kundali. Saturn in the PK chart aspects the ascendant and Moon as well as ascendant Lord Sukra in the PK chart itself. Transiting Saturn will be in Leo (Simha) till September 2009. Ganesha, on the basis of the inferences drawn by delineating the above horoscopes and points, feels that the brothers will get united, at least on the commercial front and settle issues out of the court, amicably. Notice that as Moon and Saturn are involved, there seems to be a possibility of their mother, becoming a mediator. There are also chances of a trust being restored (formed) and both the brothers and their families pledging their ownership shares to the trust, removing all future possibilities of them fighting again or their dependents and descendants squabbling over the empire that Late Shri Dhirubhai built. The possibilities of these brothers reconciling are very high between February 2009 and September 2009. Wishing both the brothers get reunited by Ganesha's Grace.